Have you ever wondered how your child will survive as she gets older? Will she be bullied? Will she be depressed? Will she do well at school? Modern research informs us that our parenting experiences have a powerful impact on the key emotional systems in the human brain. • 45% of young people experience bullying before the age of 18. • 26% of those bullied have experienced bullying on a daily basis. • 40% of respondents reported being bullied for personal appearance, 36% reported being bullied for body shape, size and weight. • 39% have never told anybody that they are being bullied. From the Office of National Statistics we learn that it’s not just adults who are affected by depression and other mental health conditions. 10% of children in Great Britain aged between five and 16 have a recognisable mental disorder and 4% of children suffer from an emotional disorder such as anxiety or depression. Every year, more than 4000 pupils are permanently excluded from school for bad behaviour. In the past, we have blamed these statistics and situations on child neglect, child abuse, the effects of financial hardship etc. However your EVERYDAY parenting is a SIGNIFICANT FACTOR. Yes – the way that we parent our children has a major impact on the behaviour and emotional life of our children in later life. The good news is that armed with this knowledge, we can adapt our parenting styles to nurture our child’s brain and body so they are better equipped to manage stress. Reassuringly, you don’t need to be supermum or superdad. 90% of the human brain’s growth takes place in the first five years of life. These are the critical years yet you only need to be a good enough parent; you don’t need to be the perfect parent. The developing brain in the early years is very vulnerable to stress. However if you are an emotionally responsive parent, you will help your child to establish effective stress-regulating systems to take them through to adulthood. What is an emotionally responsive parent? • If your child is upset (over something relatively trivial in your mind), take their distress seriously. Try to understand from their perspective and use words that your child uses. • If your child is excited and happy, respond accordingly in your voice and energy. • Use physical soothing – yes the power of a hug. A great book on this topic is “What Every Parent Needs to Know” by Dr Margot Sunderland. This is a topic that I am fascinated by and particularly how it affects the business mum, so I will be sharing more insights over the next few weeks. Are you a business mum struggling with guilt? Do you struggle to balance work and family life? Do you worry you are damaging your relationship with your children? 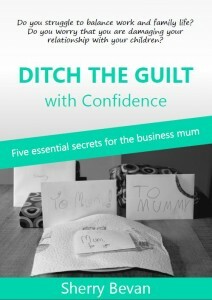 You’ll love my free guide 5 Essential Secrets the Business Mum Needs to Ditch the Guilt with Confidence. I could really relate to this post. I was a working mother and had a child with special needs. School was very challenging and he had a lot of bullies. I was there and he turned out great. Thanks Sandy – Glad you were able to relate to this post. Being a working mother when you have a child with special needs must bring its own additional challenges. Sherry, I recall a story of a boy being bullied and mum going to school to deal with it. Often children who tell their parents then don’t want them to get involved. Double edged sword time, because if they do it could make things worse (repercussions) and it’s bound to continue if they don’t. Being a parent has to be the hardest job in the world. Definitely a double-edged sword. And so often, in hindsight, we might have made different decisions. And that’s when we need to learn self-love for ourselves and forgiveness. Give ourselves permission to make mistakes. Parenting is the most rewarding yet challenging experience. There are so many ways to be wrong when you think you’re right and so many ways to be right when you think you’re wrong. I love that you talk about empathizing and taking your child seriously; I think that’s HUGE!! In my opinion, one of the fastest ways to connect with your child at any age is to have empathy for what they are experiencing! Thanks so much for sharing this! Glad you appreciated this post Robyn. To me, the way that we parent is incredibly powerful for the future well-being of our children and their children.